Bigcommerce is an all-in-one SaaS ecommerce platform for growing and established online businesses that want a powerful solution in a user-friendly package. Build an online store from scratch or migrate from an existing platform with the easy-to-use store builder, featuring industry-leading templates designed to convert sales. Bigcommerce is loaded with features and integration's to manage an entire business, allowing for advanced customization's in a simple user interface. Try Bigcommerce today with a free 14-day trial. We realized we needed a larger, more stable platform for our 110,000+ customers and Big C was a perfect fit for our company.The Big Commerce platform is very easy to use and set up for your website. Very simple to set up shipping values and even payment systems. There is an app store within the back end that is FULL of additions you can add to your store. We use about 9 apps that range from SEO to live visitors on the website and analytics of where they are from and what pages / products they are looking at. I highly recommend Big Commerce mostly because of the ease of use and the 24/7 customer phone support you receive. Anytime I have had an issue or couldn't figure something out, I called them and they answered the question normally within 5 minutes. We have migrated our Magento 1 site to BigCommerce after ongoing frustration with Magento 2.3 extension quality and caching issues. We've achieved a lot in a 2 week period and launched in a month.The stability of it is great. The admin UI is very easy to use and intuitive. It has advanced pricing controls and other B2B features. The templates are great and we really saved a lot of time with a customization. If you have strong e-commerce skills in house, I honestly believe you can be live in a month or two. We found ourselves solving lots of problems that we'd normally require a developer for. It's very robust if you can stay on its rails. There are a lot of plug-ins, although some are expensive with monthly subscriptions. Starting at $29.95 with far more built in features than any other platform. Bigcommerce plans are built for growth, giving businesses of every size access to the features they need to optimize their store and increase brand exposure. Enterprise: Contact BigCommerce for pricing information. Ecommerce now represents more than 7% of all retail sales, exceeding $3.5 trillion within the next five years. Bigcommerce offers a way for both individuals and businesses to increase their share of that pie. The all-in-one platform is redefining enterprise eCommerce. Bigcommerce powers eCommerce websites for brands around the world, including big names like Toyota, Cetaphil, and Martha Stewart. Bigcommerce offers a way for businesses to sell their products online, with customizable templates and advanced features designed to increase web traffic and conversions. Pre-integrated payment options ensure that shoppers always have a way to pay for the products they buy, whether they’re shopping on desktop or mobile devices. Built-in SEO and conversion tools are available for growing businesses. High-volume retailers can take advantage of Bigcommerce’s reliable platform to grow revenue and optimize operations. Merchants want to sell more products online, and Bigcommerce gives them a way to do just that. The web-based eCommerce platform provides solutions for small, fast-growing businesses, as well as global brands and Fortune 500 companies. Key features like single-page checkouts, abandoned cart savers, and “buy” buttons for social media empower merchants to grow their businesses in a way that makes financial sense. Bigcommerce also boasts advanced capabilities such as couponing and discounting, faceted search, automatic shipping calculation, fraud prevention, and reporting. Storefronts are designed with responsive themes, using popular code languages and frameworks for higher-than-average uptime. Bigcommerce handles the management of its clients’ servers, with a multi-layered approach to online security that involves perimeter and server-specific firewalls, file integrity scanners, intrusion detection software, and 24/7 human monitoring. In addition to providing merchants with a way to sell physical goods on the Internet, Bigcommerce also offers a number of marketing tools and strategy guides. Bigcommerce is designed to meet the needs of merchants who don’t have extensive web design backgrounds, however it also gives advanced users the ability to adjust HTML and CSS on their own. Merchants who use Bigcommerce have access to an expansive collection of themes, which have all been designed to meet the needs of businesses in a number of industries or verticals. The company’s intuitive design platform offers a straightforward way to build the types of stores that engage and convert shoppers on a mass scale. Customize whichever theme you select, even if you have no coding experience whatsoever. Bigcommerce lets you add a company logo and branding elements. You can also promote featured or top selling products at the top of your site. Shoppers will be funneled to a single-page checkout. You’ll benefit from its advanced SEO, which gives you control over your URLs and metadata. Most online merchants can’t afford to hire in-house SEO experts. With that limitation in mind, Bigcommerce has decided to handle SEO for its users. The company provides merchants with tools designed to automatically optimize every page to maximize rankings on all the most important search engines. Bigcommerce automatically generates optimized product page URLs and titles based on product names, however you still have the option to customize those URLs if you wish. You can also customize your site’s title, header tags, meta descriptions, keywords, and alt tags. A number of advanced features, like product reviews, rich snippets, and a built-in blogging platform, are designed to improve reach via organic search, as well. Bigcommerce’s abandoned cart saver gives merchants an easy way to recover lost sales. Customizable controls allow merchants to decide for themselves when their abandoned cart emails go out and what they say. Coupons can also be used to increase conversions. Design your store’s abandoned cart emails, taking the time to customize the subject lines and email language that your visitors will receive. You can actually set up a series of emails with increasingly powerful recovery tools (like coupon or discount codes), which Bigcommerce will send to shoppers who’ve left your site. Pre-integrated payment options ensure that shoppers always have a way to pay. Big commerce’s one-click setup lets merchants immediately start accepting major credit cards and PayPal payments. Bigcommerce can even help merchants accept payments from international buyers using multiple currencies. Bigcommerce has negotiated lower rates for credit and debit card processing with PayPal, which they pass along to merchants. As a merchant, you have the option to choose from a number of pre-integrated payment options, including Authorize.net, Heartland, and 2Checkout (hosted). In addition to accepting orders through your website, you can also take phone and mail orders right away. Bigcommerce encourages merchants to integrate their stores with leading third-party applications for marketing, inventory management, shipping, and accounting services. The company offers an extensive app marketplace, where users can browse all apps and integrations, along with themes, partner services, and offers. Free 15-day trials are available for new users. After that time, users can choose from one of four plans, which range in price from $29.95 per month to $199.95 per month. Custom order-based pricing is available through the Enterprise plan, as well. 1. Faster results, superior ROI: since we are a cloud based solution, you no longer have the burden of owning infrastructure. Go to market time is on average 1/2 that of an on-premise platform like Magento, and total cost of ownership is 1/4 the cost. Money previously spent on hardware, hosting and maintenance can be reinvested in the business and tech teams can focus on higher-impact projects than fixing broken code and deploying patches and updates. 2. Flexible customizable SaaS: our open architecture enables you to seamlessly connect with critical business software - we offer one-click integrations, as well as powerful APIs & webhooks to build integration from scratch. Unlike competing platforms, we don't limit API calls. Additionally, our strategy differs here from Shopify; we believe in building an open platform, so you have the power of choice to integrate your own payment provider and Point of Sale, instead of pointing you to our home-grown solution. 3. Extraordinary shopping experience: the Bigcommerce theme framework is brand new and contains the bleeding-edge of site design capabilities. We offer beautiful easy-to-customize themes with drag and drop content blocks (Instagram feed, featured single product, blog featurette, etc) and highly-optimized one-page checkout. For customers customizing their sites, developers don't have to learn proprietary languages like Shopify's Liquid-- they can code in popular Handlebar languages. Developers will be delighted to know we offer local staging environments (preview changes across desktop and mobile displays using real-time catalog without pushing updates to your live store). Merchandisers will love that they can also personalize the storefront based on shopper behavior and purchase history. 4. Hub for all your sales channels: Bigcommerce unifies all aspects of commerce with Bigcommerce Channel Manager, an area where you can discover and connect to new sales channels. We sync product information, orders and inventory across channels so you no longer have to work in multiple interfaces to sell on multiple channels. Bigcommerce is one of the only ecommerce platforms partnered with social networks Facebook, Pinterest, and Twitter to offer access to "social buy buttons," and we are closely partnering with Amazon to build a market-differentiated native integration. 5. A complete all-in-one solution: from conversion tools, to shipping functionality, to flexible promotions & discount rules, Bigcommerce offers all the capabilities you need to run a successful business built right it, without the need to pay for dozens of apps for basic functionality. Below are some frequently asked questions for BigCommerce. Q. What type of pricing plans does BigCommerce offer? Q. 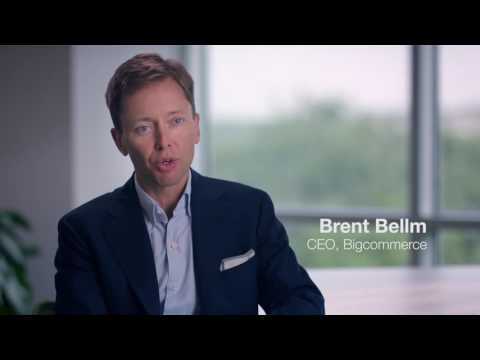 Who are the typical users of BigCommerce? Q. What languages does BigCommerce support? Q. Does BigCommerce support mobile devices? Q. Does BigCommerce offer an API? Yes, BigCommerce has an API available for use. Q. What other apps does BigCommerce integrate with? Q. What level of support does BigCommerce offer? Q. Which apps is BigCommerce compared to most often?